If you have any queries, please contact the Class teacher or the Learning and Teaching Leader for this phase: Nishad Karim. Year 3 have started the year by exploring the story of 'Grendel, A Cautionary Tale About Chocolate'. The children had the opportunity to create their own versions of the Grendel story by making books. We have also taken the children back to the Triassic period where they have started to learn about dinosaurs. Time lines have been created and we are currently exploring dinosaur habitats. Year 3 have been busy immersing themselves in the story of ‘Wind in the Willows’. The children have had the opportunity to role-play and hot seat characters in the story as well as write their own version of ‘Toad’s adventure’. 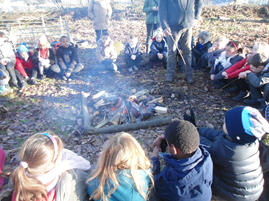 Both classes also took part in an Adventure learning session in Crystal Palace Park where they collected kindling to build a campfire, were taught to light a fire with a flint, found out about health and safety around campfires and toasted marshmallows and hot cross buns. 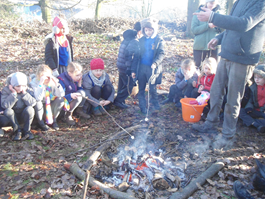 The children also used the environment to create weather poems around the campfire. As part of our 'Weather' topic, the children have researched extreme weathers around the world and the impact this has on people’s lives. 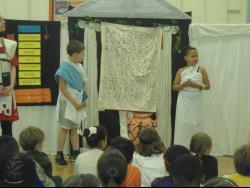 In Year 3 we have enjoyed learning about Ancient Greece. Both classes took part in a 'Greek Day' and dressed up. 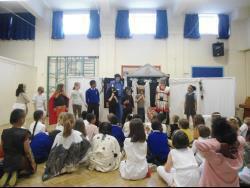 In the morning they had an interactive theatre experience, visiting the home of a wealthy Grecian woman. During this workshop the children were successfully transported back in time to Ancient Greece, where they answered seven difficult questions about this era. They completed a catch phrase with wit and originality.